Bolstered by a more robust state budget, LA Unified today said it was doubling its offer to union teachers for a raise. The latest salary proposal, unveiled during today’s contract negotiations, is a four percent boost across all salary bases. The offer comes on the heels of Governor Jerry Brown’s 2015-16 proposed state budget, which is estimated to add more than $500 million in revenue for the district. The union responded by saying the offer “doesn’t go far enough” in satisfying demands for a suitable wage increase. Later, the union said its governing body, the UTLA House of Representatives, approved moving $3 million dollars into a “reserve strike fund.” The money would be used for “organizing actions such as our massive rally” scheduled for Feb. 26 at Pershing Square. “With millions now in our organizing fund, UTLA would be in a position to strike if necessary,” a union press release said. At first blush, the district’s new offer would appear to be an increase from its previous offer of a 2 percent salary raise, along with two bonuses of 2 percent each, for an overall bump of 6 percent for the current academic year. But the new offer appears to be only equal to the previous one in that it includes a 4 percent raise plus pay for professional development days that the district says represents another 2 percent. If there is an advantage for teachers in the latest offer it’s that subsequent salary negotiations for future years would be based upon a 4 percent raise for this year, rather than a 2 percent raise. “We are all grateful for the additional state funding to support salaries and to preserve jobs and services,” Superintendent Ramon Cortines said in a statement today. In recent months, the union, UTLA, has altered its salary demands from 17.6 percent over two years to 10 percent over one year to 9 percent over one year. Until today, the district had held fast to no more than a 2 percent annual pay raise. Vivian Ekchian, the district’s chief labor negotiator, told LA School Report that the pay for four professional training days would equal an additional 2 percent. If adopted, the district’s proposal would apply retroactively to July 1, 2014. District officials said the additional state funding would also help preserve reduced class sizes and retain adult and early education programs. It would also help fund the medical benefits packages and scheduled annual raises. Emerging as another major negotiating point, teacher evaluations gained new intensity this week as the district and UTLA agreed to study a new approach to how teacher effectiveness would be judged. The effort has grown out of a ruling against the district by the Public Employment Relations Board, that the district violated state employment laws in imposing a new evaluation system on union members. The district implemented the Teacher Growth and Development Cycle (TGDC) model in 2013 after partnering with an outside consulting and research firm. 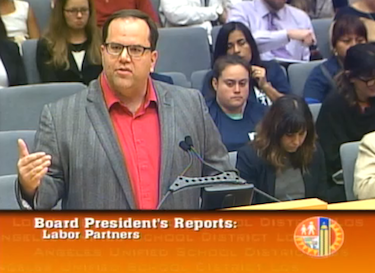 The plan included some recommendations made by teachers and UTLA members, but the PERB judge agreed with UTLA that the district acted unlawfully when it threw in additional provisions and guidelines without negotiating them with the union. The union contends this system creates a path to establish merit pay to reward the highest performing teachers. Caputo-Pearl urged the board to reinstate the district’s previous two-level teacher evaluation system as a temporary solution. “Go back to the 2011 system and forms that were used and form a committee that will actually, collaboratively, develop ways that can support and develop our educators,” he argued. In the meantime, he said, the two sides can continue to develop a new evaluation system that works for everyone. But the district has a different idea. The “Developing” rating would be intended to identify those teachers who should receive appropriate additional support, training and assistance in order to encourage and achieve the professional skill levels that represent effective instruction, and is also intended to be consistent with the advantages and purposes of the “Needs Improvement” ratings that have long been part of the Evaluation process. The “Ineffective” rating would be treated the same as the current “below standard” rating for purposes of Peer Assistance and Review and all other current contractual impacts, including but not limited to review through the grievance/arbitration procedures. The three levels would also qualify the District for the continuation of significant federal funds, which require more discerning final overall ratings than the current two-level system. The new evaluation process, which the district is calling the Educator Development and Support system, was presented to members of the bargaining committee today. Weekly contract negations will continue through the end of the month. *Adds union response to district salary offer and details of a strike fund.